Though it may seem like an odd time of year to read about growing rice it’s actually a really good time to start planning for next season. 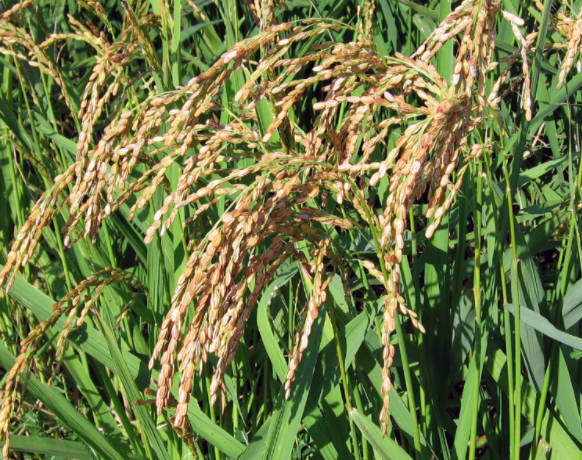 Rice is a long season crop and preparation this fall can really benefit your rice harvest. There’s also a few misconceptions about growing rice that make it less popular than it perhaps should be. The first is that rice requires flooding. Flooding is actually just a method of weed control. 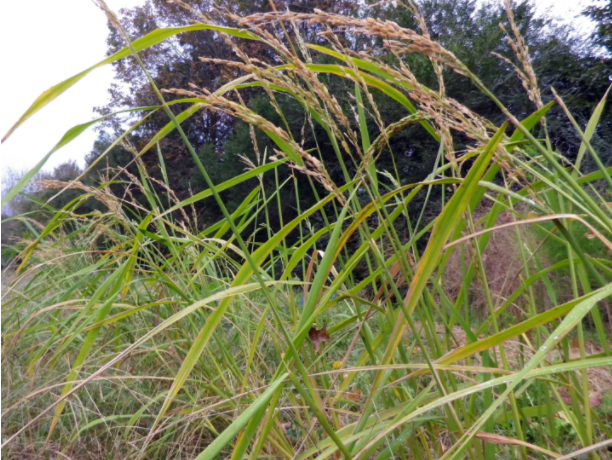 Rice does well in water while other plants like weeds do not. However it can be grown with just and inch of irrigation or rain per week. However if you happen to have a wet area on your property you’d like to put into production rice could be your answer. The second misconception is that rice can only be grown in really warm areas. In fact there are varieties of rice that can be grown as far north as Vermont. 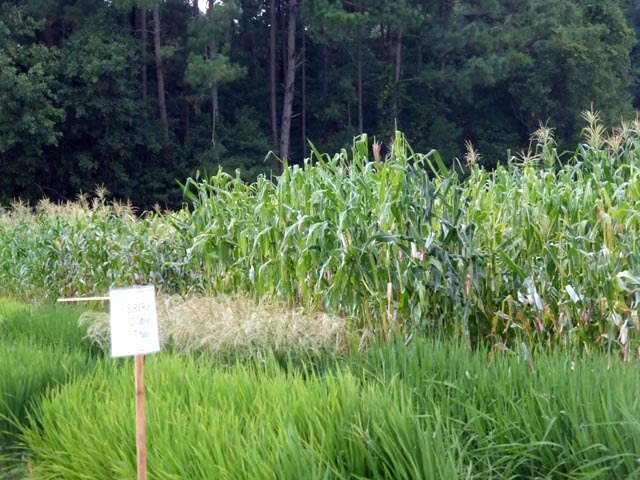 SESE has varieties that are best suited to the south and mid-atlantic regions. Lastly rice is often seen as a crop for big farmers and not necessarily backyard gardeners but you don’t need big fields or machinery to get a nice rice crop. It’s perfectly easy to grow and cultivate with hand tools. The only special equipment you need is a rice de-huller and you can find a variety of home scale models available. Whether you choose to flood your rice or just irrigate it, water is probably the biggest concern when choosing a plot. Make sure it’s an area you can easy water because of its irrigation needs. Rice also does best in fertile, nitrogen-rich soil. Compost is the perfect fertilizer for rice so if you select a plot this fall you can add about 1lb per square foot of compost and till it in. You can also grow a winter-kill cover crop like buckwheat this fall. In the spring the dead buckwheat will act as a mulch and you can plant your rice through it. The mulch will help hold moisture and prevent weeds. Rice can be planted two ways either direct sown or transplanted. For transplants seeds should be started 6-8 weeks before your desired planting date. Direct seed or transplant rice in rows 9-12 inches apart with plants about 6 inches apart in the row. Rice isn’t always grown in rows however this method has been shown to increase yields as the rice has plenty of space and nutrients and can be easily cultivated. Rice doesn’t do well with weed pressure so be sure to keep it well weeded. Small plantings of rice typically aren’t bothered by pests or disease although birds will feed on rice as it ripens so you may choose to use netting. The rice should be harvested once it’s dry and brown. There are two methods for harvesting. You can cut the entire plant as close to the ground as possible or cut just the seed head. Whatever you choose it should be noted that leaving the straw on the field will add nutrients and keep your soil healthy for next year. Once harvested, rice should be threshed and winnowed. There are machines made specifically for threshing but basically you’re just trying to break other plant material free from the grains of rice. A common method is to place the rice in a 5-gallon bucket and use a drill with a paint stirring attachment to break it up. After threshing the rice should be winnowed. This process can be done in front of a fan by pouring the rice into a bowl and allowing the fan to blow away the lighter plant material while the grains fall straight down into the bowl. This will need to be repeated several times before all the material is gone. Unlike wheat, rice also has to be de-hulled as it probably won’t come off during the threshing process. Rice can be de-hulled by rubbing it between your hands but it’s a strenuous and uncomfortable process. If you enjoy growing rice it’s probably worth investing in a home de-huller. Finally you can enjoy your rice! Just like other crops growing your own can allow you to branch out into more varieties and tastes than the one or two offered at the grocery store. Continuing our summer road trip adventures! Besides seed growers, we also visited with many vegetable breeders and researchers on our trip. Here we’ll profile four organic and sustainable agriculture research stations. 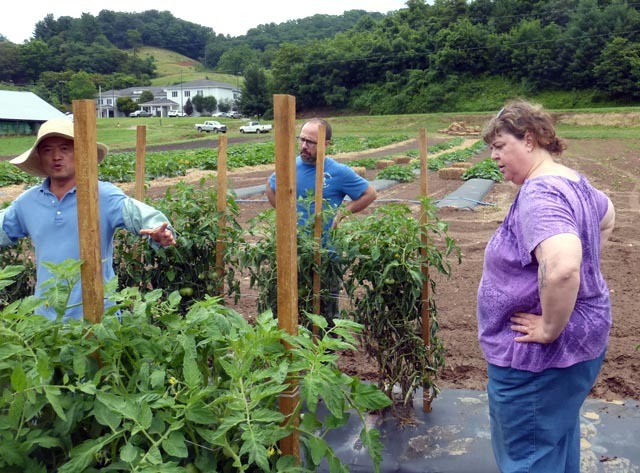 North Carolina State University’s Mountain Research Station in Waynesville, NC (near Asheville) is up in the hills, and cooler and wetter than most of NC – a great place for tomato disease trials! Here, Luping Qu, Reuben Travis, and Jeanine Davis discuss how to measure the effects of diseases for their trial notes. There’s a lot going at the Mountain Research Station. 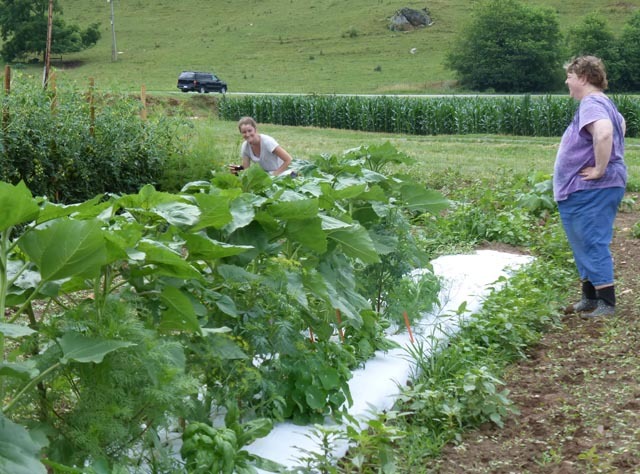 Besides tomato trials, we got to see melon and squash trials, stevia trials, hops trials, organic broccoli variety trials, and much more – here’s an overview of this year’s research projects. And that’s just the Alternative Crops and Organics part of the farm – elsewhere on the farm, there’s a big broccoli varieties trial that’s part of a multi-state project that aims, among other things, to find broccoli varieties that hold up well in the heat of the Southeast. A great practice at the Mountain Research Station farm (and at many other farms we visited) is to plant strips of flowers and herbs — usually on the edges of fields, but sometimes in the middle as well. These flowers and herbs help attract pollinators and bug predators. Jeanine is the co-author of Growing and Marketing Ginseng, Goldenseal and Other Woodland Medicinals. Her blog about the work at the Mountain Research Station is a great read. She’s a dedicated outreach person, and besides giving talks at the Carolina Farm Stewardship Association’s Sustainable Agriculture Conference, she regularly speaks at many conferences, including this year’s Heritage Harvest Festival at Monticello, September 11-12. A quick stop was the University of Tennessee’s East Tennessee Research and Education Center in Knoxville. We were already visiting three different Tennessee farms that day, but there it was, only a couple miles away from Jonathan Buchanan’s Crooked Road Farm, so we dropped in for a quick look. Much of the farm’s work is giving young beginning farmers experience growing market crops, but we also got to see pepper trials, stevia trials, and – a great new vocabulary word – ratooning trials for kale and other crops in the brassica family. Ratooning is the practice of severely cutting back plants to stimulate new growth for later production. Okra growers in the Deep South often do it, so as to keep okra plants from getting 10 feet tall or more! 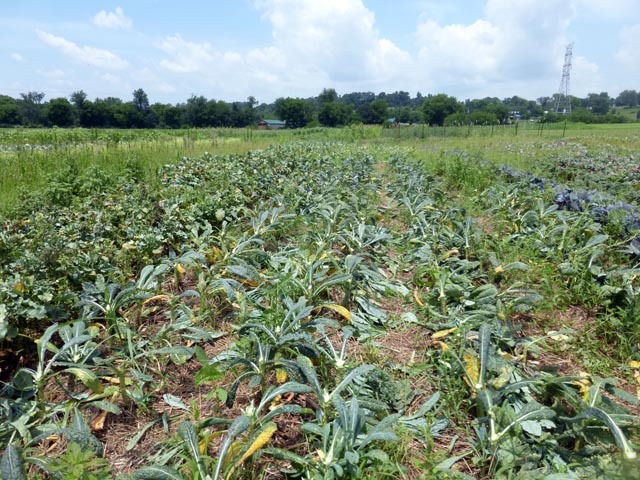 Here’s a ratooned kale crop at the East TN Research and Education Center. Next was the USDA’s U.S. Vegetable Laboratory in Charleston, South Carolina, with Clemson University’s Coastal Research and Education Center (CREC) nearby. Mark Farnham and Richard Fery with the USVL, and Brian Ward (at left below) with the CREC, showed us around. Here Mark talks about his work with breeding summer broccoli that holds up in July heat. Vegetable breeding is patient work – it can take planting out big fields of dozens of different breeding lines to find the best traits. This was July, swelteringly hot in Charleston, but there was some great looking broccoli out there – Mark’s hoping to release some of the breeding lines in the next few years! 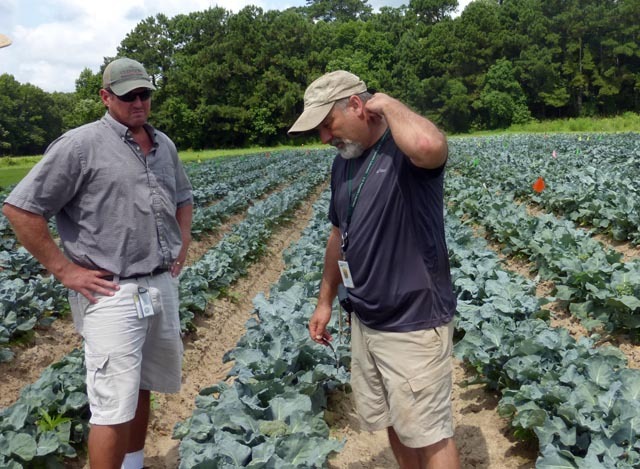 Mark (at right below) is a brassicas guy; another recent project of his and Pat Wechter’s, Carolina Broadleaf mustard, is a leafy green bred for resistance to a bacterial leaf blight that’s become a problem in the Deep South. The USVL makes small amounts of breeding stock available to seed producers, so we’re hoping to line up some of our own seed growers for this one and have it in the SESE catalog in the next few years. Richard Fery is emeritus plant geneticist at the USVL. He’s worked on many different seed crops over the years, mostly peppers and southern peas. 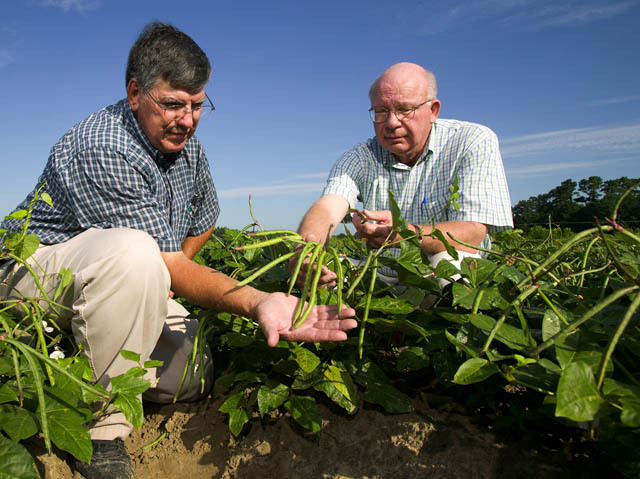 He and his colleagues bred the nematode-resistant Carolina Wonder sweet pepper, Charleston Hot hot pepper, and many others, and he’s shared seedstock with us of southern peas releases that we’re hoping to be able to offer in the next few years. He’s in the picture below at right, with colleague Floyd P. Maguire at left. Across the street, Brian Ward gave us a fast tour of the organics section of Clemson’s Coastal Research and Education Center. 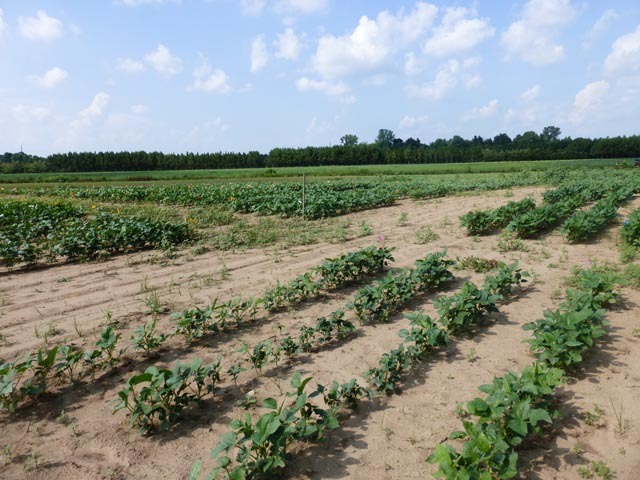 Interesting projects included watermelon seedlings grafted onto gourd rootstock for greater disease resistance and vigor, a study of alternative pollinators for watermelons, rice trials, and seed increases for heirloom varieties of peanuts, southern peas, and corn. Alas, so much to see, but so little time! Our final stop in the research portion of this trip was the Cherry Farm facility in Goldsboro, NC, for the Center for Environmental Farming Systems (CEFS), a collaboration between several NC ag departments. With 2,245 acres available, CEFS has a huge area to do all kinds of big studies, with long term studies of soil nutrition, tree alley crops, forest succession, animal husbandry, and many others. Research Operations Manager Andy Meier generously took time on a Sunday afternoon to show us around. CEFS helps provide the space and support for many NC ag folks and groups to do trials. Their variety trials this year include wheat, barley, soybeans, and this southern peas trial with four repetitions. Again, so much to see, and so little time! Next week we’ll spotlight two individuals who we visited who breed exciting new varieties.